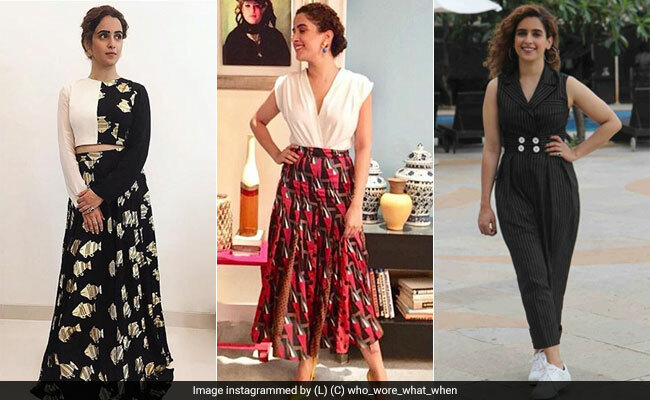 Sanya Malhotra is most popularly known as the Dangal sister but we predict that she’s a style star in the making. She has taken her fashion quotient up a few notches for recent movie promotions and in the bargain, found a friend in prints. From bright stripes to preppy plaid, Sanya’s print game is getting stronger by the day and these 7 looks are proof. Looking sizzling, Sanya pairs her black crop top with a black and white plaid midi skirt and matching pumps. Checks seem to be her favourite as she wears a breezy black, white and brown checked Urvashi Kaur dress with black pumps and chunky earrings. Sanya also knows how to go bold with prints, like the time she wore black and white tropical printed pants with a blue shirt, black belt and white sandals. She went even bolder when she wore a black and white co-ordinated set from Masaba with a fun fish print all over. Even Sanya’s neutral tones are taken one step further with prints. She pairs a polka dot and checked shirt with brown cropped pants and beige pumps. Looking brighter than ever, Sanya pairs her geometrically printed red skirt with yellow pumps and a white blouse. Sanya upgraded the basic jumpsuit with this black pinstriped beauty from Notebook which she wore with white sneakers. With a variety of prints all cleverly paired together, it’s safe to say that Sanya is fast becoming one of the finest print players on the Bollywood circuit.